in 1972, the kilmory company of argyll in scotland was at the forefront of the fishing business. they offered an extensive range of reels, hooks, rods and much of the ephemera that keeps those who sit for hours by the riverbank endlessly happy. their argyll location contributed considerably to the number at the bottom of the spreadsheet. not only did the numerous estates hold lengthy contracts with the company for the supply of appropriate gear for their many guests and clients, but those in the area and further north were content to purchase their more meagre requirements from the nearest fishing tackle store. the company's reputation was all but unparalleled. of course, they could not have grown to their pre-eminent size on homegrown sales alone. the export market provided the bulk of their income, with strong commercial interests in north america, northern europe and, ironically japan itself. this was a source of great pride to andrew killen and his partner james emory (the kilmory name had arrived by combining their surnames), since the largest share of the market at that time belonged to the shimano corporation. 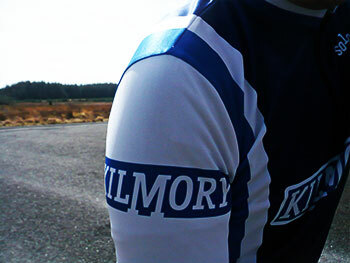 kilmory didn't quite threaten shimano's dominance, but there's little doubt they were seen as a thorn in the side. competition within the industry, however, became increasingly hard to bear, and by the time the kilmory company entered the 1980s, they were struggling to hang onto their scottish section of the market. it may be that they had ended up following the technological developments rather than creating them as once was the case, but there was little doubt that the bottom of the spreadsheet was more often red than black. yet again, ironically, it was shimano who were to bring great influence to bear on the next step killen and emory took. as both were more passionate about cycling than fishing, the dawning realisation that several of their velocipedes changed gear via componentry manufactured by their erstwhile japanese rivals, they opted to capitalise on the considerable investments they'd made in machinery and turn out a range of cycle components. many of the developments in chainset technology, including those related to the increase in bottom bracket diameters can be laid at the foot of the kilmory company, and it is a statement of fact that they were the very first to move the bearings outboard of the frame's bb shell. similarly those pins and ramps on the inner face of the chainrings can be traced back to early examples of their chainsets, aspects of chain movement developed in the process of bringing the very first compact chainset to market. 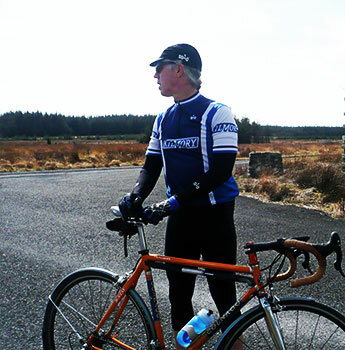 the cycling passion that existed within the offices and machine shop at kilmory found itself spilling over into the realm of cycle racing, with the formation of a european-based squad. the jersey was simple; blue and white, attesting to the colours of their national flag interrupted only by the central placement of the company name on the jersey's front, back and sleeves. 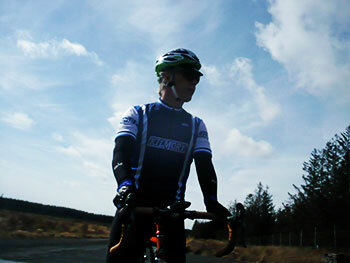 it wasn't long before the jersey was a common component of the very best of european races. in 1987, the team rode paris roubaix, and the following year flanders was added to the list of races successfully completed. kilmory's sales were good; in fact, very good. as, indeed, was their profile within the industry, a factor that not unnaturally led to commercial interest from other parts of the world. as they were poised to move into the big league, so to speak, just as the nineteen nineties hoved into view. a group of wealthy american investors made an offer that neither killen or emory could refuse, but it was only after the deal's completion that the former partners discovered the new owners intended to close down the scottish operation. the whole shebang was transferred to to the usa where, in a reversal of fortunes, sales started to decline, and becoming established in north america took longer than any of the new owners had expected. they commissioned the inevitable batch of consultants to research the root of the problem; no-one could pronounce the name. 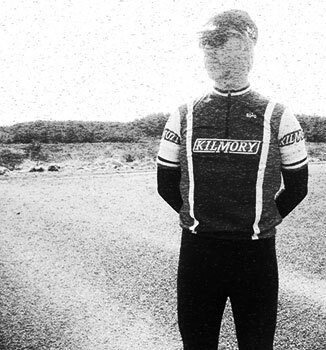 as a result, kilmory as a brand name no longer exists; the name was changed, the logo tweaked and currently the company formerly known as kilmory is one of the more notable amongst contemporary cycling aficionados. 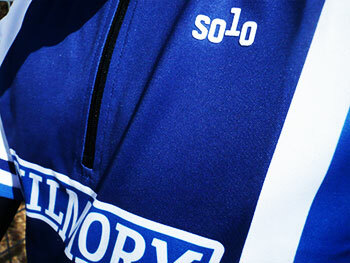 faithfully reproduced in all its blue and white glory, solo clothing of auckland, new zealand has revived the team jersey so beloved of those halcyon days of the mid-eighties. eschewing the additional sponsors' logos that inevitably inhabit the real thing, the solo jersey features a quarter length zip, ribbed cuffs and collar and not only the requisite three rear pockets, but a fourth zipped version as required by the uci (i made that last bit up). the jersey is a relaxed fit rather than the almost claustrophobia inducing race-fit that seems highly popular these days, yet it never quite reaches any degree of bagginess, happy to sit comfortably under a close-fit weatherproof jacket. the pockets are of ample leibensraum, swallowing a stowaway jacket, digital camera and a slightly larger slice of fruit malt loaf than i'd intended to cut. better still, carrying such cargo showed no signs of jumping around when those periods of out of the saddle climbing just had to be undertaken. of course, for cycling residents of argyll, there can be an additional joy to riding speedily while clad in one of these distinctive jerseys. 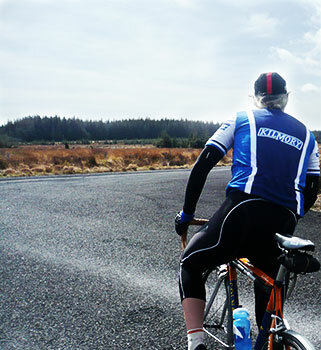 passing through lochgilphead on the way to inveraray and perhaps an attempt on the climb over the rest and be thankful the happy velocipedinalist will encounter a small roundabout that offers the rider the option of heading towards the offices of argyll and bute council.